Pull out the front door opening seal (A) as needed. Remove the kick panel (B). Disconnect the intake air duct. Remove the air cleaner (A). Do not spill brake fluid on the vehicle; it may damage the paint. If brake fluid does contact the paint, wash it off immediately with water. Press the brake pedal several times to deplete the vacuum in the brake booster. Be careful when handling the master cylinder. Do not hold it at the piston, or the piston may separate from the body. 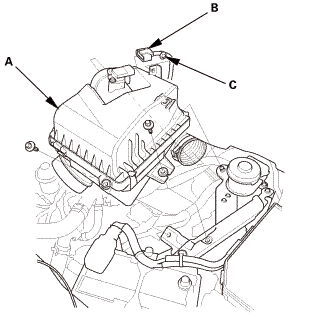 If the piston separates from the body, then the master cylinder must be replaced. Do not reinsert the piston back into the master cylinder body. 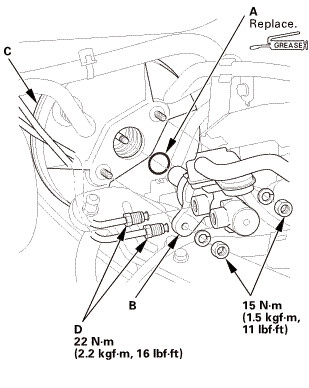 Be careful not to damage or bend the brake lines during removal and installation. After removal, plug the ends of the hoses and the joints to prevent spilling brake fluid. Make sure not to get any silicone grease on the terminal part of the connectors and switches, especially if you have silicone grease on your hands or gloves. Remove the reservoir tank (B). 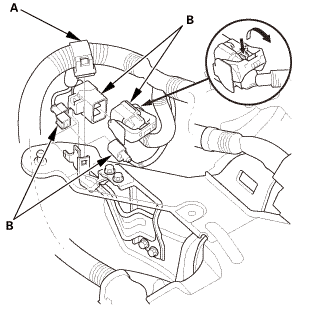 Disconnect the brake lines (A) from the master cylinder (B). Remove the master cylinder from the brake booster (C). 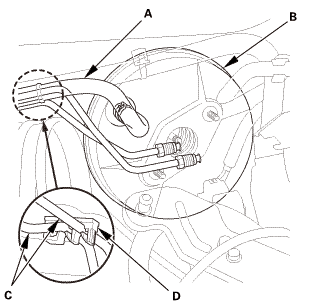 Remove the O-ring (D) from the master cylinder. Disconnect the brake booster vacuum hose (A) from the brake booster (B). 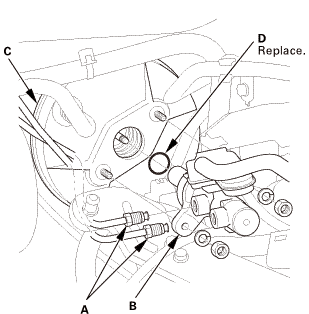 Remove the brake lines (C) from the clamp (D). Move the ECM/PCM (B) aside. 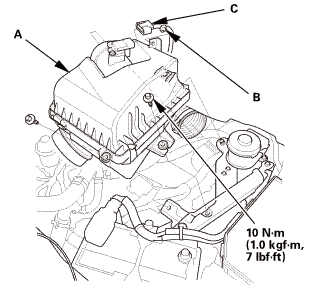 Remove the wire harness clamp (A). Remove and disconnect the connectors (B). Remove the air cleaner bracket assembly (A). 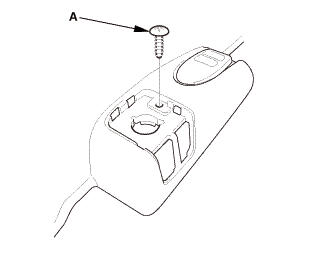 Remove the lock pin (A) and the clevis pin (B). 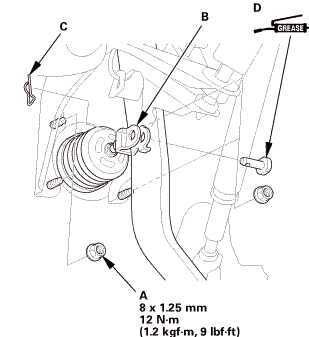 Disconnect the yoke (C) from the brake pedal. 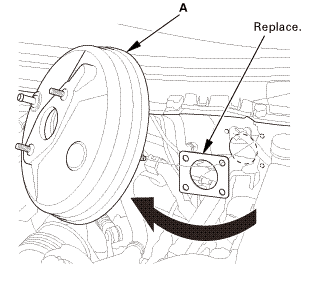 Remove the brake booster mounting nuts (D). NOTE: Be careful not to bend or damage the brake lines. 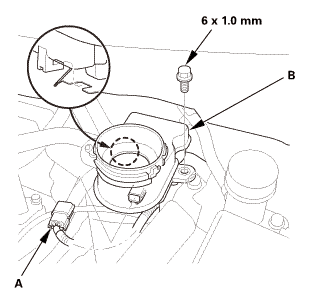 Install the brake booster (A) with the new brake booster gasket (B). Install the brake booster mounting nuts (A). 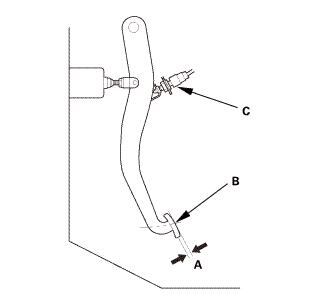 Connect the yoke (B) to the brake pedal. Install the lock pin (C) and the clevis pin (D). NOTE: Apply multipurpose grease to the yoke pin in the brake pedal. 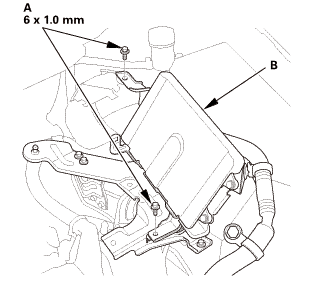 Install the air cleaner bracket assembly (A). Install and connect the connectors (A). 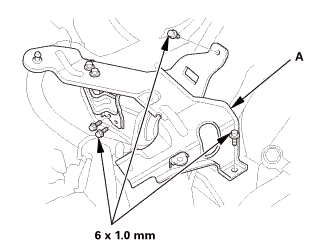 Install the wire harness clamp (B). 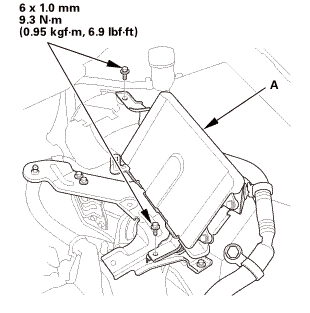 Install the brake lines (A) to the clamp (B). 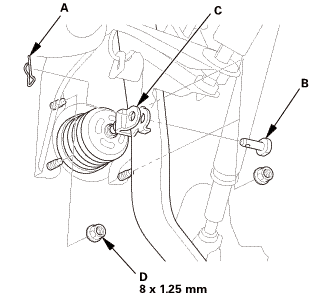 Connect the brake booster vacuum hose (C) to the brake booster (D). Install the new O-ring (A) to the master cylinder. NOTE: Coat the O-ring with the Shin-Etsu silicone grease (P/N 08798-9013). 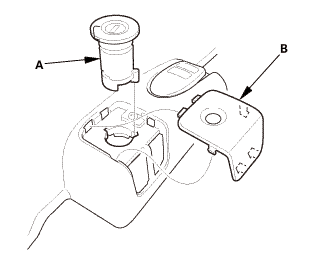 Install the master cylinder (B) to the brake booster (C). 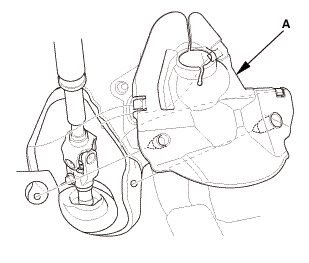 Connect the brake lines (D) to the master cylinder. Install the reservoir tank (A). Connect the intake air duct. Pull back the carpet, and find the cutout (A) in the insulation. Measure the pedal height (B) from the left side middle of the pedal pad (C) to the floor (D) without the insulation. If the pedal height is not as specified, adjust the pedal height. 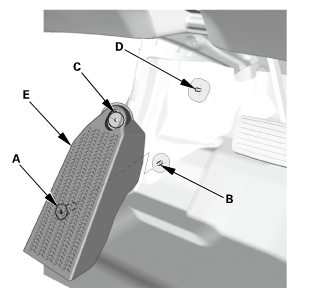 Inspect the free play (A) at the brake pedal pad (B) by pushing the brake pedal by hand. 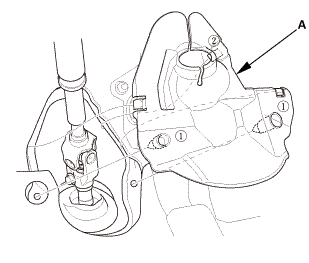 If the brake pedal free play is out of specification, adjust the brake pedal position switch (C). 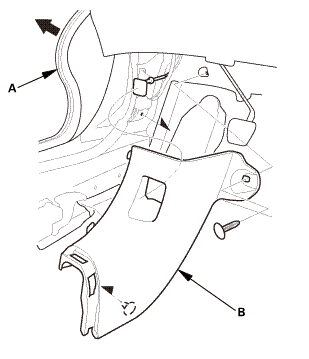 If the brake pedal free play is insufficient, it may result in brake drag. Do not reuse the drained fluid. Use only new Honda DOT 3 Brake Fluid from an unopened container. 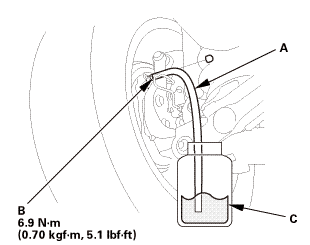 Using a non-Honda brake fluid can cause corrosion and shorten the life of the system. 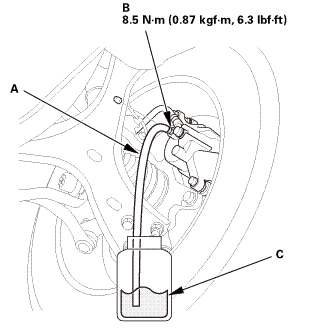 The reservoir connected to the master cylinder must be at the MAX (upper) level mark at the start of the bleeding procedure and checked after bleeding each wheel. Add fluid as required. 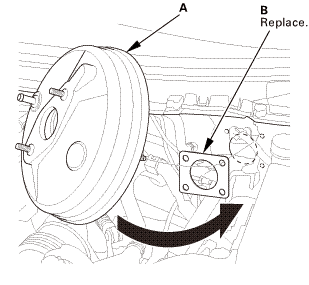 There are three different methods used for bleeding brake systems. The method shown here is the preferred manual method for removing the air from the system. For pressure or vacuum bleeding, refer to tool manufacturer's instructions included with the tool. 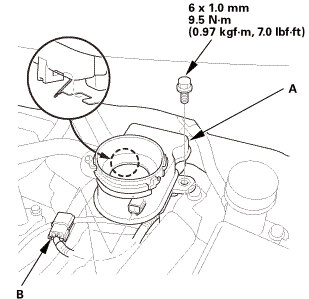 Make sure the brake fluid level in the reservoir tank (A) is at the MAX (upper) level line (B). 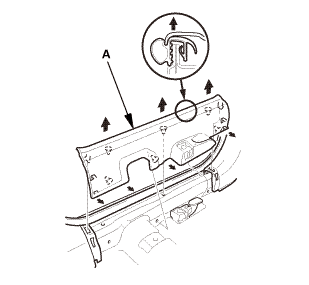 Start the bleeding at the driver's side of the front brake system. NOTE: Bleed the calipers in the sequence shown. Attach a length of clear drain tube (A) to the bleed screw (B). Submerge the other end of the drain tube into a clear plastic catch bottle of brake fluid (C). Have an assistant slowly pump the brake pedal several times then apply steady continuous pressure. Loosen the bleed screw slowly to bleed the fluid into the plastic catch bottle. The brake pedal will travel toward the floor as the fluid is bled from the system. 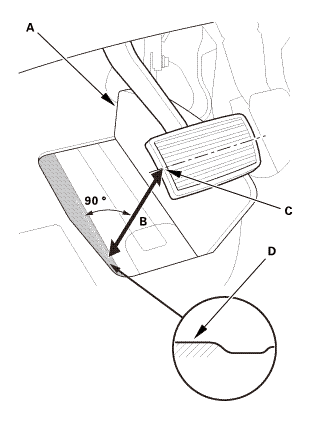 When the brake pedal reaches the floor, have the assistant hold the pedal in that position, then tighten the bleed screw. The brake pedal can now be released. 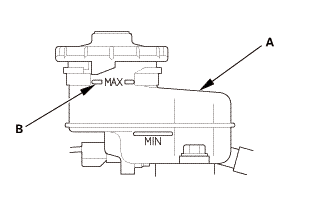 Check and refill the master cylinder reservoir tank to the MAX (upper) level line. 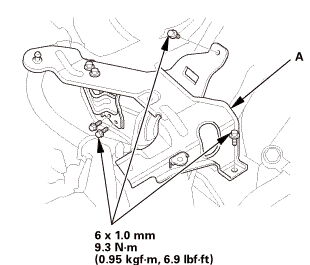 Be sure to reinstall the master cylinder reservoir cap. Repeat steps 5 thru 8 until the brake fluid in the clear drain tube appears fresh and there are no air bubbles in the fluid. 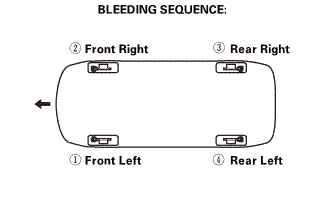 Repeat this procedure for each brake in the bleeding sequence. Spin the wheels to check for brake drag. Install the kick panel (A). Install the front door opening seal (B).